Similar to the way a PC can save documents and other files, video can be stored on a server or PC hard disk. Specialized equipment is not needed because a storage solution does not differentiate video data — it is viewed as any other large group of files that is stored, accessed and eventually deleted. However, video storage puts new strains on storage hardware because it may be required to operate on a continual basis, as opposed to during normal business hours with other types of files. In addition, video by nature generates very large amounts of data, creating high demands on the storage solution. and whether the system uses motion detection or continuous recording. The type of video compression employed also effects storage calculations. Systems employing Motion JPEG compression vary storage requirements by changing the frame rate, resolution and compression. If MPEG compression is used, then bit rate is the key factor determining the corresponding storage requirements. There are formulas for calculating the amount of storage to buy. These formulas are different for Motion JPEG and MPEG-4 compressions because Motion JPEG consists of one individual file for each image, while MPEG-4 is a stream of data, measured in bits per second. The formula does not take into account the complexity of the image, which is an important factor that can influence the size of storage required. Storage solutions depend on a PC’s or server’s ability to store data. As larger hard drives are produced at lower costs, it is becoming less expensive to store video. There are two ways to approach hard disk storage. One is to have the storage attached to the actual server running the application, called a direct attached storage. The other is a storage solution where the storage is separate from the server running the application, called a network-attached storage (NAS). If you are adding more cameras, you should monitor the server’s CPU usage so that it doesn’t exceed limitations. One hard disk is suitable for storing recordings approximately from six to eight cameras. With more than eight cameras, at least two hard disks should be used to manage the load. 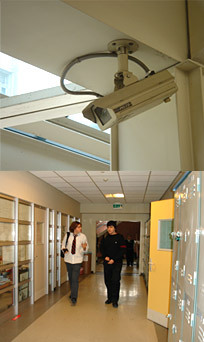 For 25 or more cameras, the use of a second server is recommended. 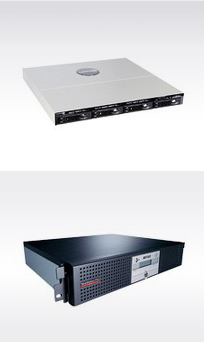 The DETEXI Video Management System will be able to control several servers. When the amount of stored data and management requirements exceed the limitations of a direct attached storage, a network-attached storage (NAS) allows for increased storage space, flexibility and recoverability. NAS provides a single storage device that is directly attached to a LAN and offers shared storage to all clients on the network. A NAS device is simple to install and easy to administer, providing a low-cost storage solution. However, it provides limited throughput for incoming data because it has only one network connection, which can become problematic in high-performance systems. The following table outlines the recommendations for server requirements in implementing an IP-Surveillance system using a video management software. The calculations are based on viewing and recording video with a 640x480 resolution and a 25 percent compression rate using Motion JPEG. Using multiple cameras and higher frame rates will raise the requirements for the server. The recommendations are not minimum requirements. The CPU recommendation is based on Pentium4 / Xeon dual processors. Other options such as Dual Core might lower the CPU requirement. Using MPEG-4 recording will lower the bandwidth usage and use less hard disk. For best performance and stability, use local hard disks for primary storage. Network storage or USB/Firewire disks should only be used for archiving (secondary storage). Software-based RAID systems should not be used since performance bottlenecks could result. The disk drive (normally C:) where Windows and a video management software are installed should have enough disk space for a video management software log files. Allow at least 1 GB free disk space for the log files. When selecting hard disks for your surveillance solution, keep in mind that the recording of a continuous stream of video from multiple cameras will add more load on the hard drive than a standard office PC or mail server. SCSI is the best solution in terms of reliability (and also the most expensive), followed in order by Serial ATA and IDE. Serial ATA and IDE are made for office desktops and not for 24-hour server operation as a surveillance solution demands. Since it is difficult to predict how long such hard disks will last, it is recommended that Serial ATA and IDE disks be installed in such a way that they are easy to replace in case of failure.